Windows has a nice feature in Networking – you just configure the IPs correctly, and the network sharing “magically” works. In Linux we will have to manually configure Samba or some other similar tool to share files between two linux systems – and that’s a bit daunting for a new user. But there is an easier way – using SSH. SSH or Secure Shell is a program for logging into a remote machine and executing commands on a that machine. Don’t worry – you won’t have to type commands to transfer files – there are GUI clients that supports SSH protocol – for example, the great Konqueror. After installing it, you have to activate it in the Services configuration utility. Once that is done, SSH will turned on at boot. 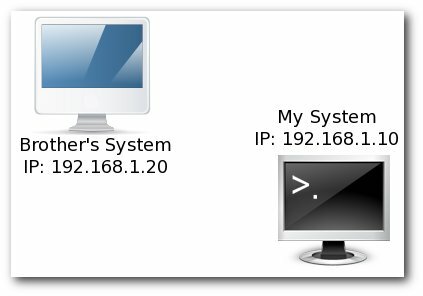 Make sure the remote machine have SSH installed and running before trying to connect to it. That is fish://[Remote User]@[Remote Machine’s IP/Name]. This will show a password prompt – where you have to input the password of the remote user. Once that is done, you will see all the files in the remote machine that is accessable by the user you logged in as. All operation you are used to in Konqueror are still supported – Copy/Paste, Drag and Drop etc – they will work between the local system and the remote machine. If you are a Gnome user, this is possible in Nautilus as well. 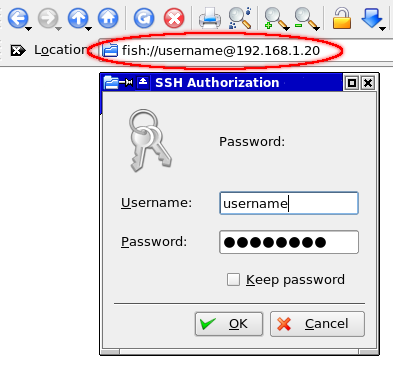 Instead of fish://username@192.168.1.20 , you have to enter ssh://username@192.168.1.20 in the address bar – protocol is ssh:// instead of fish://. Keep in mind that this is practical only for small home networks. If you are implementing a large network with permission settings, shares and stuff, go with Samba. SSH is not a choice there. Thanks for this post. It was really helpful. i found this also very useful. Thank you! That along with fun_plug has made it possible to access my D-Link DNS-323 without having to go through Samba and deal with its limitations on file names and permissions. Just what I needed. I’m using Kubuntu 12.04 and Samba is working fine for me for networking with Windows, but my Linux-Linux connections are really not working. This cracked it.